The Super Neon XL from Estes is a tube-fin rocket with a beefy appearance and an E engine mount. A taller rocket it really draws peoples attention on and off the launch pad. larger balsa ogive nose cone. smaller balsa fins attach to the tube fins. Two large decals for main body tube allow for a personal touch when finishing. This the the third rocket I ever made. Easy to read instructions. Easy to build design. Really nice nose cone for the price of the kit ($16.99 cnd). Tube fins and balsa fins were a bit tricky but patience and steady hands did the trick. Finished product is strong and sleek. Filled all the Body tube spiral with watered down elmers wood filler. Did not prime this one as it was one of the first rockets I ever made, but still got a great finish. My three year old decided that he wanted a purple and silver rocket. So we swapped the lime green body paint for metallic purple, and painted the tube fins metallic silver. Fins were done the same color as the body. We used the silver decal which turned out great. Always a straight true flight. The last flight was on an E engine, during which the Chute never deploy. The nosecone ejected but the Chute stuck at the top of the tube. The rocket floated back to earth at a relatively slow rate, landing in the snow(it was january). No damage. No cons. Everyone in the family loves this rocket. Pros: Strong design, nice straight flight every time, easy on the eyes too. 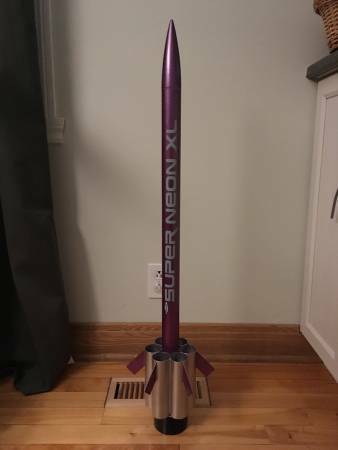 For someone looking to try a D or E engine rocket this is a great starting point. Easy to build, but not a cookie cutter E2X rocket. This one does take some time and patience, that any builder can be proud of. It will be a while before I find a rocket I like better then this one.